ABOVE: A mini-convoy of Segway scooters near the Eiffel Tower in Paris. Be footloose in Paris, without getting footsore. That could be the motto of City Segway Tours, which brings a high-tech twist to urban sightseeing. City Segway Tours has a fleet of Segway Human Transporters, more commonly known as "Segway scooters." These state-of-the-art electric two-wheelers use onboard computers, gyroscopes, and tilt sensors to maintain balance as you roll through Paris on sidewalks and park paths. Daytime tours are available year-round, with night tours from April through October. Each tour lasts about four hours. After a 30-minute orientation, you and your Segway will glide past the Eiffel Tower, Napoleon's Tomb, the Invalides, the Louvre, the Arc de Triomphe, the Place de la Concorde, and other Parisian landmarks. 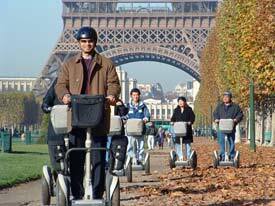 You can book Segway tours through Viator, our booking partner for European sightseeing tours and day trips. Pricing is in euros, British pounds, U.S. dollars, or Australian dollars. It's a good idea to book early, especially on weekends, during holiday periods, or in high season. Tour participants must be at least 12 years old, and a waiver or adult companion is required for riders under 18. In our experience, riding a Segway scooter is tricker than it looks, and the concentration needed to avoid running over pedestrians can be a distraction from sightseeing. You'll be more satisfied with the tour if you think of it as an adventure, and as a chance to try out a Segway under an instructor's supervision. Use this link to prebook Segway and other tours in euros, British pounds, U.S. dollars, or Australian dollars. Use this link to learn more about the tours, or to book only in euros. Photos copyright © City Segway Tours. Used by permission.